For those who don’t know, it’s currently citrus season and this bake is everything I love about our vitamin C packed friends. My decision to make these tarts came in perfect timing aka I was already sick from being in the freezing Ithaca winter. 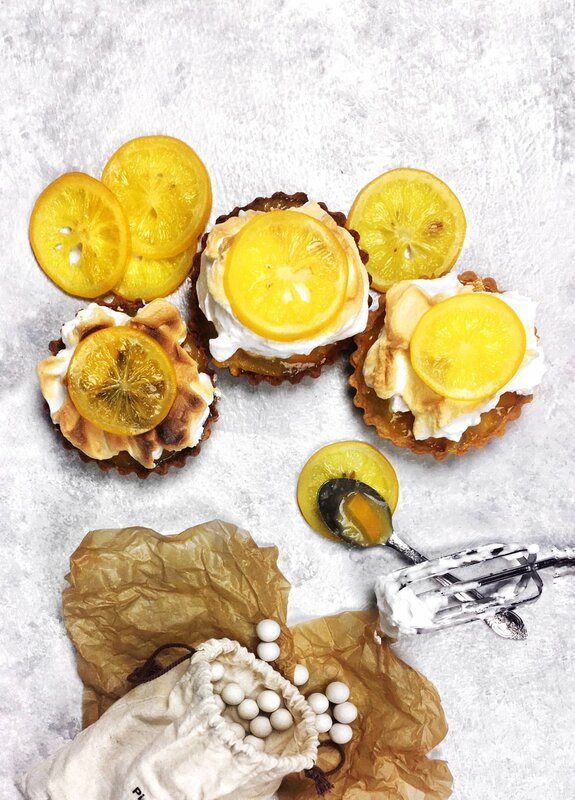 This definitely isn’t your classic Lemon Meringue Tart. For starters, there’s no lemon curd! I opted to switch the curd for a marmalade because I wanted to play around with the thicker consistency of marmalade. Also, I’m a little broke and I did’t want to use anymore eggs because everything here is so expensive. Of course, that didn’t stop me from adding extra virgin olive oil to the marmalade. I love the combination of citrus & olive oil. The fat adds another layer of flavor and texture to the marmalade that is perfectly balanced with the tart jam. So if you’re wondering what to bring to your next potluck brunch, these guys are definitely your go-to. Or if you’re just sick like me and need some vitamin C to hang out with, you’ve also come to the right place. Oh, and I also recommend listening to Lady Marmalade while you make this recipe, it’s really quite satisfying. Combine the flour, sugar, and salt in a bowl and rub in the cubed butter until coarse and crumbly. Add in the cold water and mix until just combined. Form the dough into a circle, wrap in cling film, and chill in the fridge for approximately 30 minutes. Once chilled, roll out the dough on a floured surface to about 5mm thick. Line the tart tins with the dough, prick the bottom with a fork, and freeze for 15 minutes. Place a small sheet of parchment paper to cover the pie dough and fill with pie stones, rice, or beans. Bake in a preheated 175C/350F degree oven for approximately 25 minutes, or until golden brown. Set aside to cool. In a large sauce pot, bring the lemons and water to a boil over high heat. Reduce the heat to low and simmer for approximately 45 minutes to 1 hour or until the skin of the lemons can be pricked easily with a fork. Transfer the lemon to a cutting board and remove the pulp of the lemons into a bowl, seeds included. Cut the skins into thin strips and combine with the pulp and seeds. In a clean sauce pot, combine the sliced lemon skins, pulp, seeds, sugar, lemon juice, and water and bring to a boil over medium-high heat. Reduce the heat to low and simmer for another 30 minutes, or until the marmalade sets when placed on a cool surface. Whisk in the olive oil until fully incorporated. Beat the egg whites on low speed until aerated, white, and fluffy. Slowly stream in the sugar and whisk on high speed until the sugat has dissolced and the meringue is thick and glossy. Fill the cooled tart shells with lemon marmalade. Drop a spoonful of meringue onto the top, creating ridges with the back of a spoon. It’s not a real party if there’s no pie or tart! Check out similar recipes for more crisp, buttery goodness.